Rich in Omega 3 and 6 HUFA'S, Omega One Medium Goldfish Pellets have natural pigments from Salmon skin to bring out your goldfish's vibrant colors. 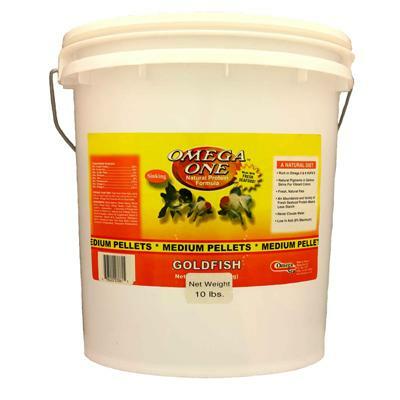 Sinking pellet, great for mid-water and bottom feeding fish. Whole Salmon, Whole Herring, Whole Shrimp, Wheat Flour, Wheat Gluten, Fresh Kelp, Soy Flour, Astaxanthin, L-Ascorbyl-2-Phosphate (Source of Vitamin C), Natural and Artificial Colors, Vitamin A Acetate,Vitamin D3 Supplement, Vitamin E Supplement,Vitamin B12 Supplement, Riboflavin, Niacin, Pantothenic Acid, Folic Acid, Biotin, Inositol, Tocopherol (Preservative), Ethoxyquin (Preservative).